You’ve gone the whole nine yards and yet you’re still seeing little or no results on your weight loss program. While losing weight seems to be a breeze for some, others find it to be a constant uphill battle they just can’t win. Medicines have a direct effect on our body’s many processes including our body weight. Non-steroidal anti-inflammatory drugs or NSAIDs (aspirin, naproxen and ibuprofen), corticosteroids and high blood pressure medication causes fluid retention. Female hormone pills for example hinder weight loss and could actually contribute to weight gain. If you’re currently under medication, the best thing to do is to discuss this with your physician. Try asking for alternative medications which doesn’t have this side effect. If this is not possible, switch to a low fat diet and a more aggressive exercise program to offset weight gain. But of course this should first be consulted with your doctor to avoid complications. A Body Mass Index (BMI) between 18 and 25 is considered normal. Losing weight after reaching your ideal weight could be difficult since this could face opposition from your body. BMI is computed by dividing your weight (in kilograms) by the square of your height (in meters). If you still believe that your are “fat” even if you’ve reached your normal weight, then this could be a symptom of a psychological or eating disorder. People suffering from Anorexia nervosa for example, go into extreme diets and exercise programs just to have a thinner figure. There are many factors that cause hormonal changes in our body. Any change in the level of hormones has a direct effect on our body’s normal processes including weight gain. Aging, medication, medical conditions, menopause and menstrual periods are just some of the factors affecting hormone levels. This is a condition that affects women more than men. Female hormone pills, menstrual periods and menopause for example are just some of the conditions that affect the levels of hormones in the body. The best way to lose weight is to tailor your weight loss program accordingly. Consulting a dietician could help you develop a personalized program could make dieting healthier and more effective. If your weight loss program requires extreme dieting then this could actually cause your body to store more fats or reduce the amount of fats being burned. Undergoing prolonged periods of “starvation” causes your body to turn into its own defense mechanisms in an attempt to compensate for such extreme measures. It reaches a point where human nature takes over and you are mentally unable to resist eating. Rather than losing weight in a gradual and healthy pace, suddenly depriving your body of its basic needs could lead to sickness. Our body requires its share of daily supply of nutrients. And that includes fats to power our daily activities. Major stumbling blocks to any diet program or any life changing decision is a person’s mental condition. Stress, anxiety and unrealistic expectations leads to self doubt undermining any weight loss program. Any changes to your normal daily routine and eating habits can be very stressing. Having a positive disposition, getting the right support (friends and family) and having realistic goals is your best defense when things are not going your way. If you are looking for a weight loss formula then we have the “answer” for you: The Answer Appetite Reducer. Designed specifically to reduce your appetite, increase lean body mass, increase metabolic rate and thermo genesis, burn more calories and increase your energy, The Answer Appetite Reducer has all of these capabilities in one simple tablet. If you are tired of trying every diet and weight loss product out there on the market, then tire no more! The Answer Appetite Reducer dietary supplement is all you need to get the results you want. 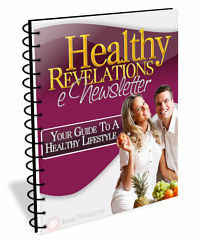 Go to www.HealthyRevelations.com for more information. Having a healthy body is not all about having a slim or muscular figure. We don’t only have to take care of our physical appearance but more importantly what is inside our body. Each day our body is exposed to various toxins. This could be found in the air we breathe and the food we eat. Detoxifying is a great way of getting rid of these pollutants to keep our body working in tip top shape. It compliments a healthy lifestyle improving the benefits of eating healthy and living an active lifestyle. To help you get started in your detoxifying journey, below are some tips you could start at home. Load up on water – Most of our body is made up of water. And loading up on water goes a long way in helping our body flush out toxins. All it takes is eight glasses of water and that’s the minimum. However, getting a few extra glasses of water each day doesn’t hurt either. Exorcise those toxins through exercise – Help the body get rid of toxins by spending a few minutes each day exercising. Sweating is a great way of coxing sweat out of the body. Get the benefit of having a slimmer figure while eliminating harmful toxin buildup. Get those veggies – Eating vegetables helps get rid of toxins. This is especially useful for cleaning the digestive tract. It makes it easier for the body to flush it through our solid waste. It provides bulk to our feces decreasing our risk for developing colon cancer. Fruit and Juices – Whether eaten directly or in its liquid form, fruits are good detoxifying agents. Just like water, fruit juices course its way through our body flushing toxins along the way. Turn your favorite fruit into a juice or make it your favorite snack. A great alternative to processed food and snacks. Fasting for a day – Give your body the best opportunity to get rid of toxins by letting it focus on detoxification. Drink plenty of fluids such as water and juices. This could be done once every month. Living a healthy lifestyle is striking a balance. Never fast for more than a day. You shouldn’t confuse fasting for detoxification with dieting. Body wraps – Body wraps promotes sweating. Increase the benefits of using body wraps by matching it with detoxifying oils. Body wrap treatments are not only a good way of helping your body detoxify but is also a simple way of releasing stress. This way you don’t only get rid of physical toxins but also mental toxins as well. Stay clear of toxins – Don’t just get rid of toxins but prevent it from coming back by living and eating healthy. Stay clear of dirty or polluted environments. Toxins could also enter the body through the air. Eat healthy food that promotes detoxification while avoiding processed foods. There are many facets to a healthy body. Eating healthy foods and living an active lifestyle is just part of the process. Helping the body rid itself of toxins should not be ignored. Get the complete healthy lifestyle by incorporating each discipline. During physical activity, we can be prone to injuries. We can lose balance and trip over, fall and sprain an ankle. We can prevent injuries during workouts by strengthening our muscles before embarking on an exercise program. Strengthening core muscles improve balance and flexibility and enable us to exercise effectively to burn fat and build muscle. However, muscle strengthening is not all about exercise; it also needs balanced nutrition. The purpose is this article is to identify the types of diets which can strengthen muscles effectively. Protein is essential in your diet to encourage growth of muscle mass. This is because a protein-rich diet can provide you with amino acids needed for your body to recover from stress and injury. Amino acids are also needed to rebuild and strengthen muscle tissues after exercise. However, be careful with the type of protein you should include in your diet. You may include lean protein foods such as eggs, beans, chicken, turkey, legumes and low-fat or nonfat dairy products. Complex carbohydrates differ from plain carbohydrates because they are slowly digested, thus providing a slow but steady release of glucose for energy. Consuming this type of carbohydrate can boost your energy levels, especially during a muscle strengthening workout. Consuming carbohydrates also spares protein from being used up for energy in the body. A good example of a complex carbohydrate is the type of carbohydrate found in oatmeal. Oatmeal is high in dietary fiber, which in turn releases steady energy while keeping blood glucose levels at a normal range. Oatmeal also helps you control your appetite and prevents hunger pangs by making you full all the time. Other foods with complex carbohydrates are whole grain foods and yams. Fat is not all that bad; in fact, you need a reasonable amount of healthy fat to strengthen your muscles. This is because a healthy amount of fat can build muscle and can help rebuild skin, hair, nails and joint tissues. Choose to include monounsaturated and polyunsaturated fats in your diet such as the ones found in olive oil, nuts, seeds, canola oil and fatty fish like salmon. These fats can help decrease high cholesterol levels in the blood and can protect you against cardiovascular disease. For muscle strengthening, consider consuming a diet that allows you to eat frequently. Eating frequently has been shown to promote weight loss and burn fat. This is because more frequent eating encourages your body to burn calories during digestion every time you eat. The more frequent digestion is, the more calories are burned. Each of your meal portions should contain only 300 to 400 calories. Frequent eating can also help manage protein stores in the body so that protein is not utilized for energy but only in the building and repair of muscle tissues. There should be six small meals per day to help you shed fat and prevent hunger pangs. Warm up exercises – get your blood circulation going and warm those muscles up. If you’re planning to carry weights or just do a couple of heavy exercises, limbering up will be your best defense against muscle sprains or injury. Get the help of a professional – if this is your first time going to the gym or are planning to seriously get into an exercise regimen, getting the help of a gym instructor is a must. At least get a friend who has experience. Lifting weights in the gym could be dangerous. If you’re trying to lift a heavier weight enroll the help of a friend who could assist you if anything goes wrong.